To determine if non-invasive oxygenation indices, namely peripheral capillary oxygen saturation (SpO2)/fraction of inspired oxygen (FiO2) and partial pressure of alveolar oxygen (PAO2)/FiO2 may be used as effective surrogates for the partial pressure of arterial oxygen (PaO2)/FiO2. Also, to determine the SpO2/FiO2 and PAO2/FiO2 values that correspond to PaO2/FiO2 thresholds for identifying acute respiratory distress syndrome (ARDS) in patients following coronary artery bypass graft (CABG) surgery. A prospective derivation-validation cohort study in the Open-Heart ICU of an academic teaching hospital. Recorded variables included patient demographics, ventilator settings, chest radiograph results, and SPO2, PaO2, PAO2, SaO2, and FiO2. Linear regression modeling was used to quantify the relationship between indices. Receiver operating characteristic (ROC) curves were used to determine the sensitivity and specificity of the threshold values. One-hundred seventy-five patients were enrolled in the derivation cohort, and 358 in the validation cohort. The SPO2/FiO2 and PAO2/FiO2 ratios could be predicted well from PaO2/FiO2, described by the linear regression models SPO2/FiO2 = 71.149 + 0.8PF and PAO2/FiO2 = 38.098 + 2.312PF, respectively. According to the linear regression equation, a PaO2/FiO2 ratio of 300 equaled an SPO2/FiO2 ratio of 311 (R2 0.857, F 1035.742, < 0.0001) and a PAO2/FiO2 ratio of 732 (R2 0.576, F 234.887, < 0.0001). The SPO2/FiO2 threshold of 311 had 90% sensitivity, 80% specificity, LR+ 4.50, LR- 0.13, PPV 98, and NPV 42.1 for the diagnosis of mild ARDS. The PAO2/FiO2 threshold of 732 had 86% sensitivity, 90% specificity, LR+ 8.45, LR- 0.16, PPV 98.9, and NPV 36 for the diagnosis of mild ARDS. SPO2/FiO2 had excellent discrimination ability for mild ARDS (AUC ± SE = 0.92 ± 0.017; 95% CI 0.889 to 0.947) as did PAO2/FiO2 (AUC ± SE = 0.915 ± 0.018; 95% CI 0.881 to0.942). PaO2 and SaO2 correlated in the diagnosis of ARDS, with a PaO2/FiO2 of 300 correlating to an SPO2/ FiO2 of 311 (Sensitivity 90%, Specificity 80%). The SPO2/ FiO2 ratio may allow for early real-time rapid identification of ARDS, while decreasing the cost, phlebotomy, blood loss, pain, skin breaks, and vascular punctures associated with serial arterial blood gas measurements. Circulatory and cardiovascular diseases (CVD) remain the leading cause of death globally . In 2013, 17 million (32%) of NCD deaths were attributable to CVD, a number expected to rise to 11.1 million by 2020 , and > 23.6 million by 2030 [3–5]. Coronary artery disease (CAD), the most common type of CVD, is the leading cause of death, morbidity and decline in quality-of-life (QoL) globally, and is predicted to remain so for the next 20 years [2, 3]. Coronary artery bypass graft (CABG) surgery is a common revascularization technique used to re-establish or improve flow to under-perfused regions of the heart. Predicting outcomes in postoperative cardiac surgery patients has proven to be an extremely difficult task. The severity-of-illness scoring systems that are commonly used in medical ICUs have not been very useful in predicting death in these patients, as high scores are often not associated with poor outcome [6–8]. This may in part be due to our ability to normalize physiology by means of pharmacologic and/or mechanical support. The reported incidence of acute respiratory distress syndrome (ARDS) in patients undergoing open heart surgery with cardiopulmonary bypass (CPB) is 0.4–2.5%, with an associated mortality rate up to 68.4% [9–12]. The current ARDS definition (Berlin Criteria) requires arterial blood gas (ABG) measurement to monitor the partial pressure of O2 in arterial blood (PaO2) and includes a minimum PEEP value to account for the effect of mechanical ventilator settings on PaO2/FiO2 . However, the Berlin definition is only slightly better than its predecessor for ARDS prognostication (receiver operating characteristic [ROC] area under the curve [AUC], 0.577 vs 0.536). This may be partially related to the dependence of both definitions on PaO2/FiO2 as the primary measure of ARDS severity. Multiple studies have shown that PaO2/FiO2 is not an independent mortality predictor in ARDS [14–16]. The PaO2/FiO2 does not reflect other aspects of lung injury severity such as mechanical ventilation settings, changes in lung compliance, and pulmonary shunt . Additionally, concerns about anemia, excessive phlebotomy, and a movement to minimally invasive approaches have led to fewer ABG measurements in critically ill patients . We investigated the performance of the peripheral capillary oxygen saturation (SpO2)/FiO2 and partial pressure of alveolar O2 (PAO2)/FiO2 oxygenation indices to PaO2/FiO2 (P/F) in identifying post-operative ARDS in CABG patients. Additionally, we seek to determine the threshold values for SpO2/FiO2 (S/F) and PAO2/FiO2 (PA/F) that correlate with P/F ratios consistent with ARDS (mild 201–300; moderate 101–200; severe ≤100 mmHg). 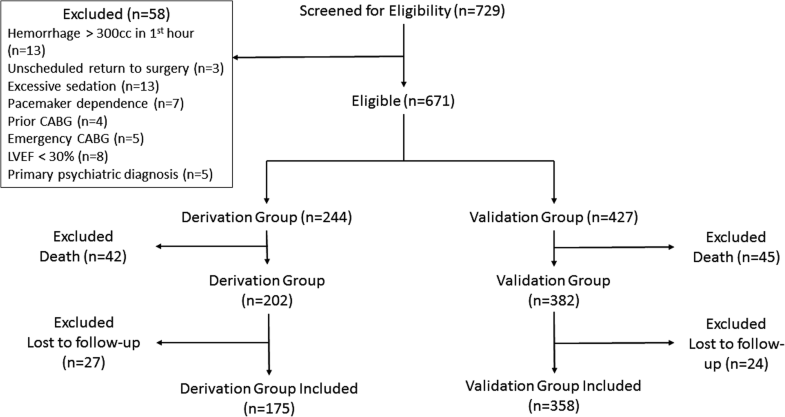 We conducted a prospective derivation-validation cohort study in the Open-Heart ICU of an academic teaching hospital from October 1, 2011 to April 31, 2012. All patients undergoing CABG surgery during this period were screened for enrollment. The study protocol was approved by the local institutional investigative review board. All study parts were reviewed according to the Strengthening the Reporting of Observational Studies in Epidemiology (STROBE) Statement: guidelines for reporting observational studies . Patients were eligible for study participation if: (1) age ≥ 18 years, (2) full code-status, (3) first CABG surgery, (4) non-emergency CABG Surgery, (5) left ventricular ejection fraction ≥30%, and (6) informed consent provided by the patient, legal guardian, or healthcare surrogate. Patients were excluded for: (1) post-operative hemorrhage > 300 ml in the first hour post-op with need for Surgical intervention; (2) unscheduled return to surgery; (3) pacemaker dependence; (4) history of prior CABG; (5) emergency CABG; (6) left ventricular ejection fraction (LVEF) < 30%; (7) psychiatric comorbidity; or (8) excessive sedation requirements. Sedation levels were determined in accordance with published recommendations [20–22]. Recorded variables included patient demographics, ventilator settings, chest radiograph results, and SPO2, PaO2, FiO2 and SaO2. These latter were used to calculate S/F, PA/F and P/F ratios. Corresponding measurements of SPO2 and PaO2 from patients (n = 175) undergoing CABG surgery were utilized to establish the relationship between S/F, PA/F and P/F ratios. All mechanical ventilation settings were performed by three intensivists, and settings were consistent with routine standard-of-care including low VT ventilation strategies. All patients were ventilated using Dräger Evita® XL or Evita® 4 ventilators (Dräeger Medical, Inc., Lubeck, Germany). SPO2, PaO2, and FiO2 were measured once per patient upon study enrollment, and SPO2 was recorded at the time of ABG sampling. In rare cases when this was not possible, the SaO2 measurement closest temporally to the SPO2 value was utilized. To optimize SPO2 measurements, investigators utilized optimal patient and sensor position, ensured sensor cleanliness, and used only measurements with satisfactory waveforms. No position changes or endobronchial suctioning was performed within 10 min of measurement, and no invasive procedures or ventilator changes were performed within 30 min of measurement . SPO2 was observed for a minimum of 1 min before the value was recorded. Like other studies, measurements with SPO2 > 97% were excluded from analysis because the oxyhemoglobin dissociation curve is flat above these levels . Corresponding measurements of SPO2 and PaO2 from patients undergoing CABG surgery (n = 358) were used to establish the relationship between S/F, PA/F and P/F ratios. The inclusion, exclusion and mechanical ventilation settings in the validated study were like the derivation group. Moreover, ABG measurements and SPO2 data were collected at similar time points using methods like the derivation data set. The sample sizes were determined using data obtained from a pilot investigation (unpublished): derivation (n = 30), validation (n = 50). Calculations were performed using G*Power version 3.0.10 (Universität Düsseldorf, Germany; available online at http://www.psycho.uni-duesseldorf.de/abteilungen/aap/gpower3/) [14, 15]. Calculations were performed for the variable P/F ratio, with an effect size of 0.3. With an alpha level of 5%, a confidence level of 95%, a power of 90%, and anticipated attrition of 10%, sample sizes of at least 150 and 300 patients were needed in the derivation and validation groups respectively. Normally distributed continuous variables are expressed as the means ± standard deviation (SD). Normally distributed continuous variables were compared using the t-test. Categorical variables were compared using the Chi-Square (χ2) and Fisher’s Exact tests as appropriate. The correlation between S/F, PA/F and P/F ratios were analyzed using Pearson correlation analysis. Linear regression modeling was utilized to compare the relationship between S/F, PA/F and P/F ratios. ROC curves were plotted to determine the prognostic values of the S/F and PA/F threshold values correlating with P/F ≤ 300. For each ROC curve analysis, sensitivity, specificity, positive and negative predictive values (PPV and NPV), positive and negative likelihood ratios (LR+ and LR-), and probabilities for having a good surrogate when test is either positive or negative were used to predict the outcome (having good surrogate) in the validation data set. The Hanley and McNeil method was used to calculate the AUC for each ratio, following which the AUCs were compared using methods that we have previously published . In all analyses, P < 0.05 was considered significant. All analyses were performed using IBM® SPSS® v23.0 (IBM Corp., Armonk, NY), STATA 10 (Stata Corp. LLC, College Station, Texas, USA), and GraphPad Prism 5© (Graph Pad Software Inc., La Jolla, CA). Scatter plots of S/F and PA/F vs P/F ratios were utilized to determine the linear relationship between the three measurements. A linear regression model was then used to quantify the best regression line. The equation for this regression line was employed to determine the threshold values for S/F and PA/F ratio that correlate with P/F ratios consistent with ARDS (P/F ≤ 300). The (S/F)/(P/F) and (PA/F)/(P/F) ratios were plotted against FiO2 and SPO2 to assess the effect of each on the relationship. ROC curves were plotted to assess the degree of discrimination between S/F and PA/F with P/F ratios and to slightly adjust the S/F and PA/F ratio threshold values for ARDS to optimize the sensitivity and specificity. Linear regression modeling was utilized to quantify the relationship between S/F, PA/F and P/F ratios in the validation data set. ROC curves were plotted to determine the sensitivity and specificity of the threshold values derived from the derivation data set for ARDS, with the AUC calculated to assess the degree of discrimination between the ratios. A total of 729 eligible patients were screened for the study. See Figure 1 for the patient flow diagram. Fifty-eight did not meet inclusion criteria. Six-hundred Seventy-one patients consented to participate in the derivation (n = 244) and validation (n = 427) cohorts. Eighty-seven subjects died (derivation 42, validation 45), 51 were lost to follow-up (derivation 27, validation 24), and 533 were analyzed (derivation 175, validation 358). There were 18 (derivation 7, validation 11) instances where the SPO2 and ABG could not be sampled at the same time, in which case the nearest SPO2 was used (all within 30 min). Patient demographics, clinical features, and physiologic respiratory variables are summarized in Table 1. A total of 20 (28.2%) patients were ventilated during cardiopulmonary bypass. The mean pre-op LVEF was 47.75 ± 7.87% (P/F = 48.96 ± 8.60, S/F = 46.04 ± 7.80, PA/F = 48.26 ± 7.17; p = 0.414). Subjects were transfused a mean of 2.06 ± 0.79 units of packed red cells (P/F mean = 1.92 ± 0.83, S/F n = 2.29 ± 0.75, PA/F n = 1.96 ± 0.77; p = 0.20), of which 15 (21.1%) were allogeneic (P/F = 5 (20.8%), S/F = 5 (20.8%), PA/F = 5 (21.7%); p = 0.996). Six (8.5%) received inotropes (P/F = 3 (12.5%), S/F = 2 (8.3%), PA/F = 1 (4.3%); p = 0.604). Mean duration of post-operative intra-aortic balloon pump support was 67.38 ± 21.45 h (P/F 67.29 ± 16.68; S/F 70.00 ± 22.99; PA/F 64.74 ± 24.61; p = 0.71). Our data met the criteria only for the PF ratio for mild ARDS (PF 200–300). The mean time between charted PaO2 and SPO2 pairs was 50.27 ± 11.65 s (Derivation 50.21 ± 12.18; Validation 50.30 ± 11.40). In the derivation cohort, the S/F and PA/F ratios could be predicted well from P/F, described by the linear regression models S/F = 71.149 + 0.8PF and PA/F = 38.098 + 2.312PF, respectively. According to the linear regression equation, a P/F ratio of 300 equaled an S/F ratio of 311 (R2 0.857, F 1035.742, < 0.0001) and a PA/F ratio of 732 (R2 0.576, F 234.887, < 0.0001). 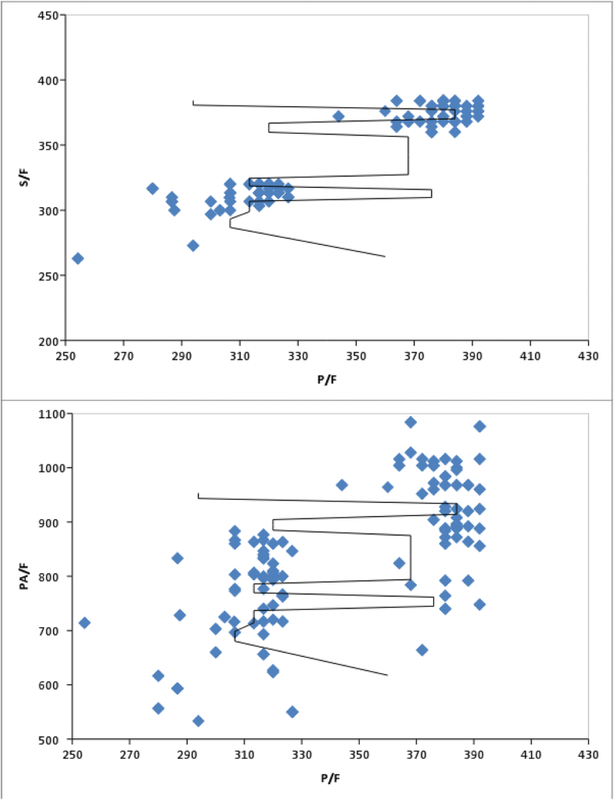 The scatter plots for the (S/F vs P/F) and (PA/F vs. P/F) ratios for the derivation and validation data sets is shown in Figs. 2 and 3 respectively. The S/F threshold of 311 had 90% sensitivity, 80% specificity, LR+ 4.50, LR- 0.13, PPV 98, and NPV 42.1 for the diagnosis of mild ARDS. The PA/F threshold of 732 had 86% sensitivity, 90% specificity, LR+ 8.45, LR- 0.16, PPV 98.9, and NPV 36 for the diagnosis of mild ARDS. S/F had excellent discrimination ability for mild ARDS (AUC ± SE = 0.92 ± 0.017; 95% CI 0.889 to 0.947) as did PA/F for mild ARDS (AUC ± SE = 0.915 ± 0.018; 95% CI 0.881 to0.942). ARDS manifests as acute refractory hypoxemia, bilateral pulmonary infiltrates and non-cardiogenic pulmonary edema, and has a very high mortality . The Berlin Criteria (2012) [13, 24] defines ARDS by 4 main characteristics: (1) Timing within 1 week of known clinical insult or new or worsening symptoms; (2) Chest imaging with bilateral opacities not fully explained by effusions, lobar/lung collapse, or nodules; (3) Origin of edema not fully explained by cardiac failure or fluid overload; and Oxygen impairment defined as mild (200 mmHg < P/F ≤ 300 mmHg, with PEEP or CPAP ≥5 cmH2O), moderate (100 mmHg < P/F ≤ 200 mmHg, with PEEP ≥5 cmH2O), or severe (P/F ≤ 100 mmHg, with PEEP ≥5 cmH2O). It is known, however, that ARDS criteria may be met in post-op CABG patients in the absence of true ARDS. Thus, a need exists to improve diagnostic specificity . Owing to concerns about anemia, excessive phlebotomy, and a movement to minimally invasive approaches, we investigated whether non-invasive indices of oxygenation (S/F, PA/F) performed equal to or better than P/F in identifying post-operative ARDS in patients post-CABG. Despite wide recognition of the high morbidity and mortality associated with ARDS, few interventions have been observed to decrease either. One reason for this may be late or delayed diagnosis, rendering the S/F ratio a rapid, convenient, and useful diagnostic tool. A study by of 1742 matched measurements of SpO2 and PaO2 in adult patients undergoing general anesthesia sought to identify a correlation between the S/F and P/F ratios by incorporating the S/F into the respiratory component of the SOFA score and found that both predicted similar outcomes . Results were less convincing in the pediatric population, where only a weak correlation between S/F and P/F was noted in children with acute lung injury (age 1 month to 18 years) . 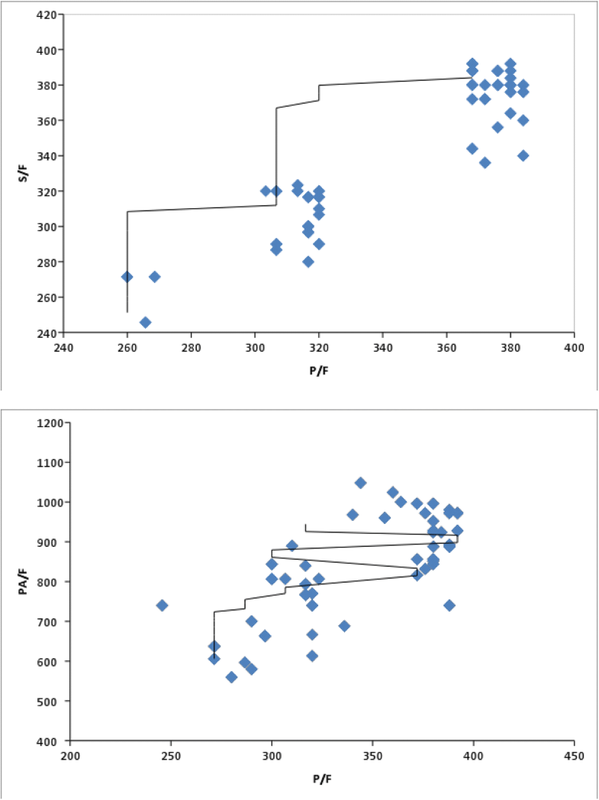 In an analysis of patients from the ARDS Network, S/F ratios of 235 and 315 correlated with PF ratios of 200 and 300 respectively . Our findings were in keeping with prior reports that S/F ratios correlate with P/F ratios [18, 28–30], supporting our finding that an S/F ratio of 311 correlates with a P/F of 300 (Sensitivity 90%, Specificity 80%). Advantages of using the S/F (aka SpO2/FiO2) ratio in the diagnosis of ARDS are many. It may allow for real-time monitoring, is dynamic allowing for rapid identification of oxygenation changes, and may allow for earlier diagnosis. Additionally, it allows for a decrease in phlebotomy, blood loss, fewer skin breaks, fewer vascular punctures, and less associated pain. Furthermore, it is affordable, time saving, and already standard practice in most ICUs [31, 32]. Despite obvious advantages and utility of S/F, its use may not be appropriate for all situations. For example, some factors that limit the accuracy of pulse oximetry include methemoglobinemia, oximeter location, cardiogenic shock and temperature . Other factors to consider include patient position andcognitive status (eg. delirium, agitation), which may alter measurements due to movement. Therefore, to decrease the risk of error and resultant misdiagnosis, a steady wave form as described in our study should be used. In conclusion, cardiac surgery with cardiopulmonary bypass elicits a systemic inflammatory response that increases the risk for ARDS. PaO2 and SaO2 correlated in the diagnosis of ARDS, with a P/F of 300 correlating to an S/F of 311 (Sensitivity 90%, Specificity 80%). The S/F ratio may allow for early real-time rapid identification of ARDS, while decreasing the cost, phlebotomy, blood loss, pain, skin breaks, and vascular punctures associated with ABG measurements. Project conception, design, implementation and data acquisition was performed by FRB, AVA, BF, RG, SS, SH, SMMM, MK and MAKK. Data analysis was performed by AVA and ACM. Manuscript writing and revision was performed by ACM, AT, and AVA. All authors read and approved the final manuscript. Dr. Miller is residency trained in both Emergency Medicine and Internal Medicine from the State University of New York (SUNY) Downstate Medical Center in Brooklyn, NY. He then completed fellowships in Pulmonary Medicine at the University of Pittsburgh Medical Center in Pittsburgh, PA, followed by Critical Care Medicine at the National Institutes of Health in Bethesda, MD. He is currently Clinical Associate Professor and Chief, Division of Research in the Department of Emergency Medicine at East Carolina University Brody School of Medicine. He is highly published and experienced in the clinical investigation of respiratory failure, resuscitation, and shock. Dr. Miller is Director of the MORZAK Collaborative through which he has cultivated a strong working relationship with investigators in numerous countries. In the current project, Dr. Miller worked with investigators in Iran to investigate whether non-invasive oxygenation indicies may be used to diagnose ARDS in post-op patient’s following CABG surgery. The protocol was approved by the investigational review board at Baqiyatallah University of Medical Sciences. Consent was required and covered both study participation and publication of findings. Informed consent was required prior to cardiac arrest event and could be provided by the patient, legal guardian, or healthcare surrogate.